With the varieties of sets available, identify your set to find on the chart 2008 US Mint proof set value. Collectors had a choice of individual sets of State Quarters both in the clad version and silver version. Presidential dollars continued their series with a distinct offering. Additionally, the 2008 American Legacy set was expanded and enhanced. Proof versions of circulating US coinage collecting remains strong. 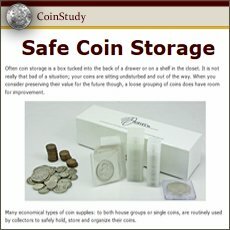 Attention to condition of the coins and packaging underpins values. Future collectors of these sets will value coins in Gem condition and appreciate original packaging in a condition of gentle use. 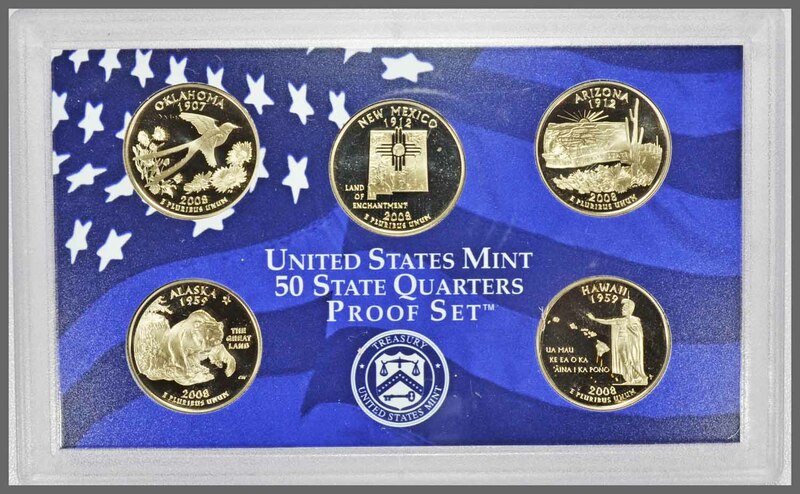 A diverse set of coins are featured - 14 in all total the clad alloy 2008 proof set. Three plastic cases display the coins with the State Quarters and Presidential dollars within their own cases. One plastic case houses five proof denominations-- cent through Sacagawea dollar. Insert holding the coins is a graphic of the US Flag in shades of light to dark blue printed with white text and stars. Within a second plastic case are the final five State Quarters completing the series that began in 1999. A matching insert inside the case of a blue shaded US Flag graphic, white lettering and stars. A third plastic case presents the four Presidential Dollars. A sealed case holds the coins in a manner to view the lettering found on the edge of the dollars. A colorful graphic highlights the proof coins, recognizable is the US Flag and US Constitution. Reverse of the case is a sold golden color with the US Mint Logo. An outer box protects the three cases. Upper view of the Statue of Liberty in light to dark blue is portrayed. Mint logo in red and blue over deep blue lettering stating the set and year - 2008 identify the clad version proof set. A final piece to complete the set is a Certificate of Authenticity two-folded card. This card identifies the set and gives details of the metal composition of the coins. All coins of the set are the same metal alloy as circulating coinage. Special preparation and striking separates these proof coins from regular issues. Available from the Mint as a separate option, collectors purchased State Quarters in a single set. 2008 represents the last of the series and these clad alloy (same metal content as circulating coinage) proofs remained popular. One plastic case features five State Quarters set against a blue graphic of the US Flag. Text of the insert is printed in white along with stars highlighting the coins. Opposite side of insert is solid blue printed with the State Quarters Logo in white. The single plastic case is protected by a cardboard box illustrated with a Bald Eagle, Logo and text in blue. Year of the set - 2008 and names of the states in silver color text further identify the set. Included is a folded Certificate of Authenticity describing the set, proof coin striking properties and metal content of the set. An option to collect silver versions of a proof dime, half dollar and State Quarters was available in 2008. 14 US proof coins total the silver proof set. Three cases display the coins. First case houses the cent, nickel, silver dime, silver half dollar and Sacagawea Dollar. Each coin is separated by an insert featuring the US Flag in shades of red highlighted with white stars and text indicating "Silver" coinage in the set. Five silver State Quarters in a second plastic case are displayed against a similar red toned flag graphic inset. Reverse of the case finds a solid red insert with the State Quarters loge in white. The third plastic case displays the four Presidential Dollars. Case is enhanced with a color graphic insert of a US Flag and upper view of the US Constitution. An outer cardboard box to fit the three cases is imprinted with an upper view of the Statue of Liberty in shads of red, US Mint Logo and red text indicating "Silver Proof Set" and year - 2008. Dual folded Certificate of Authenticity, considered as part to complete the set, describes the coins and gives the silver alloy composition. Additionally, inspect the coins to insure they remain in Gem Proof condition. Non-hazy, bright and free of spots and discolorations are the original condition the coins left the mint. Gently handled packaging retains value of complete set. Popularity of the State Quarters continued to the final year. A separate proof set offering by the US Mint featured five silver proof quarters. This set contained the State Quarter in one plastic case with the coins displayed within an inset featuring a red toned US Flag. "Silver Proof Set" along with text identifying the set in white printed on the insert. White stars highlight the design of the insert. An outer box, considered part of the set and value is illustrated with a silver-grey tone Bald Eagle aside the State Quarters Logo and silver-grey text identifying the set and year - 2008. Along the lower edge the five states are listed. Continuing the design throughout the series the reverse of the box is a map of the US with the states honored in 2008 highlighted. To complete the set is a folded Certificate of Authenticity with conformation of the 90% silver alloy of the proof coins. Value of silver forms a solid base to how much the set is worth. Currently 4/22/2019 the five silver proof quarters are $13.55 in base value alone. A separate set containing the four Presidential Dollars was an option in the 2008 US Mint offerings. Collectors could purchase these as a single set. The case is designed to allow viewing the edge of the coins. Issue date of the proof dollars - 2008 along with "E Pluribus Unum" (Out of Many, One) and "In God We Trust" is on the edge. The mint in San Francisco minted the coins and its mint mark "S" is also part of the edge inscription. Insert within the plastic case displays the US Flag and the US Constitution. Outer box protecting the plastic case is of Washington before an assembly during the signing of the Constitution. On the reverse of the box are the four presidents honored by the proof coins. The four proof dollars are of a Manganese-Copper alloy giving the coins their golden color. A high-end proof set offering was available from the Mint in 2008. Proof coins of the circulating coinage representing the denominations cent through Sacagawea dollar and four Presidential Dollars totaling 14 coins. Featured is the 2008 Bald Eagle Silver Dollar as the fifteenth coin. Three plastic cases house the 14 proof coins, in the first are the four Presidential dollars set within a black insert. A special "edge view" feature to the case allow sight to the edge of the coins that feature the date - 2008 - "E Pluribus Unum" and "I God We Trust" impressed on the edge. A second plastic case with black insert contains the proof cent through Sacagawea dollar. In a third case are the final five State Quarters completing the series. An impressive Bald Eagle silver dollar is within a round plastic capsule to complete the coins of the 2008 United States Mint American Legacy set. A very dramatic highly detailed eagle in flight is featured on the obverse. Reverse is the US Seal. This commemorative dollar is 90% silver with a total weight of .773 oz. of pure silver. Housing these coins is an impressive display case with the plastic cases set in a black tray. Side panels fold open with descriptions detailing the commemorative dollar. A fold out stand contains a pocket with a Certificate of Authenticity issued by the US Mint. An outer sleeve protects the case and a waving US Flag is illustrated in silver. 2008 is a distinct year in proof sets completing the 10-year State Quarter series. Values of these sets include the popularity and demand from the many collectors who followed the series through the years as well as new and future collectors. Praise to Oklahoma, its heritage and its people themed the Oklahoma State Quarter. Spanning rim to rim across the design is the state bird, the Scissortail Flycatcher. A welcome bird providing insect control to the farmers. Forming the background design is the state wildflower, Indian Blanket. Native to Oklahoma its colors, red to yellow, brighten the fields in summer and fall. Entry into the Union - Oklahoma 1907 - forms the upper part of the design. As well as receiving a new State Quarter in celebrating Oklahoma's statehood, the date of issue - 2008 - as noted by acting Deputy Director of the Mint Dan Shaver in the celebration speech "Oklahoma quarter serves as an encore to the State's centennial". Portraying the theme "Land of Enchantment" the New Mexico State Quarter is dated 2008 along the lower part of the design. Highly textured with typography showing the varied landscape is a map of New Mexico forming the background of the design. Detail of the map shows the Rio Grande River noted on the left bordering the raised area of the Rocky Mountains. On the right side of the map is the Pecos River with the Sangre de Cristo mountain range to its side. Central to the design is the Zia Sun Symbol. Found also on the state flag, the symbol originates from the Zia people an Indian tribe of the New Mexico area. Noting the date of entry into the Union - New Mexico 1912 - is the upper part of the design. Panoramic Vistas is the theme of the Arizona State Quarter. Its design captures the beauty of the state and its varied landscape. A well-defined ribbon inscribed "Grand Canyon State" the nickname for Arizona. The ribbon separates the two distinct designs and elements of the quarter. An endless view of the Grand Canyon is in the background. Within the design are well detailed steep canyon walls and the flattop terrain. Carved by the Colorado River the canyon is a major attraction to northern Arizona. In the foreground is the Saguaro Cactus, growing up to 40 feet it is native to the Sonoran Desert region in the southern area of Arizona. Arizona entered the Union in 1912 dated at the top of the design. 2008 dated at the lower part of the design is the year of issue. The huge area of the state is the theme of the Alaska State Quarter and "The Great Land" celebrates the vastness. A dynamic scene of a powerful grizzly bear fishing in the swirling rapids at the base of a waterfall fills the design of the Alaska State Quarter. The salmon depicted run the many rapids of the river systems to spawn and are a huge natural resource. Well detailed within the design is an evergreen tree at the top of the falls symbolizing the forests of Alaska. Included above the design is the North Star an important aid in exploration and navigation. Alaska - 1959 - is the year of statehood and at the lower rim - 2008 - year of minting the State Quarter. 2008 proof set value must include the achievement of the US Mint as the Hawaii State Quarter holds the distinction of the final coin completing the series. Central to the design is the standing portrait of King Kamehameha I with extended arm towards the Hawaiian Islands. He established the islands under a single leader brining peace and ending the conflicts among the islands. Finely detailed holding a staff and robe. Eight major islands are depicted spanning outward; Hawaii known as the "The Big Island", Maui, Oahu, Kauai, Molokai, Lanai, Niihau, and Kahoolawe the small uninhabited island. Hawaiian saying "UA MAU KE EA O KA AINA I KA PONO" translates to "The Life of the Land is Perpetuated in Righteousness" is inscribed. Entry into the Union; Hawaii - 1959 - is above with 2008 the year of minting the coins in the lower area of the design. Capturing the beauty of wildlife in Oklahoma, a Scissortail Flycatcher in flight is central to the design of the Oklahoma State Quarter. Texture in the rendering of the wings and feathers portrays the unique, long tail feathers in great detail. 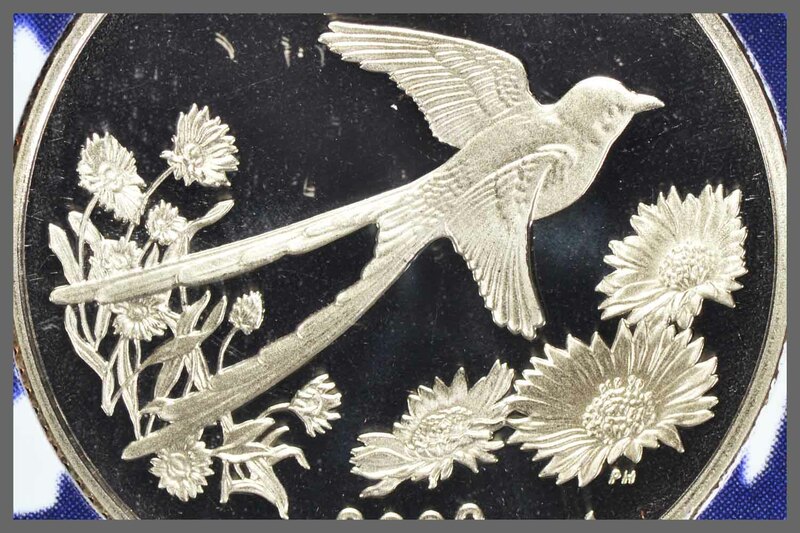 Outstretched wings and the high relief of the engraving conveys the "flight" of the design. Beneath the Flycatcher is the Indian Blanket wildflower. Three open blooms are highly detailed, showing individual pedals and seeds. On the left is a stand of Indian Blanket in stages of its growth. Open full bloom flowers are identifiably due to fine engraving detail. A seed pod is also recognizable within the delicate stems. Designer Susan Gamble and Sculptor Phebe Hemphill teamed to create the finely engraved intricate design set in high relief. With the completion of the State Quarters program in 2008 these five quarters take on a "final year" status with collectors. Inspection and judging the condition of the coins is needed. Both the silver and clad version quarters are popular and collectors seek coins in Gem Proof condition. An additional important coin is the last year of the Memorial reverse Lincoln cent. 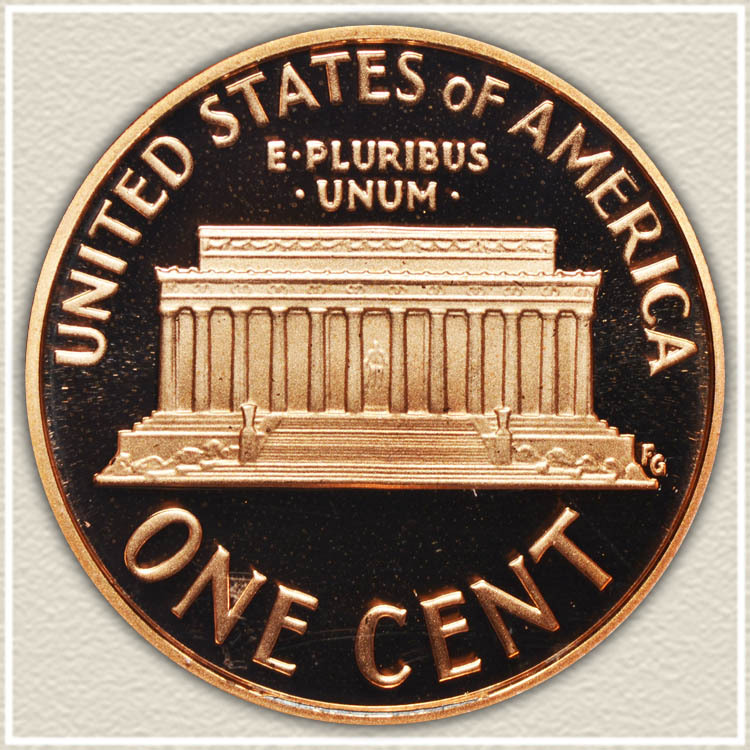 The Memorial cent was first issued in 1959 and completed its continuous run in 2008. Inspect the surfaces of the coin; gem condition is noted by the absence of spots. When first minted and released the surfaces of the coins are bright with frosted designs and extremely reflective fields. The coin blanks received special burnishing treatment, enhancing the surface prior to minting. Special preparation of the dies used to strike the coins included a frequent high polish and striking of the coins twice. Protected by the plastic case, gem proof coin are free of marks to the surface, discolorations, and radiate with a haze free luster. US Mint proof sets are a diverse collection of coins. Each set is listed separately on the chart beginning with 1955. Proof coins collected as sets is a popular area of collecting and values reflect both demand and specific themes within each series. All US coin values. 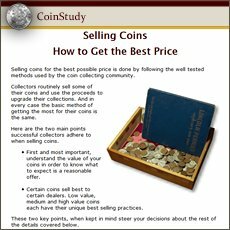 Identify your old coins using the image links leading to value charts. Date | Mintmark | Condition are considered in value and each is described and imaged within each series. Surprising value is found in the smallest of detail.